Jared is on vacation this week, so enjoy this article that originally aired December 23, 2013. Sometimes it feels like we are in the wild west of Magic: the Gathering when it comes to sudden price spikes and card buyouts that seem to affect the market on a weekly basis. It feels like every week I am hearing that this card or that card was bought out and the price has gone up 200%-400%. Just like a shootout, it seems as if the first person to draw their gun (or in this case, their wallet) and fire (click “add to cart”) is the winner. And it only seems to get worse as time goes on. Let’s ponder for a quick minute – who the heck is actually pulling the trigger on these calls like Disrupting Shoal and Phyrexian Obliterator (which even seemed to spike twice?) Is it individuals that have amassed enough ammunition (money) and have good enough aim (experience) to hit every single target faster than the rest of us? Are they the Billie the Kids and Jesse James of the Magic market? Is there a domino effect of casual speculators with more money than sense? The answer is probably yes to both. As the popularity of Magic increases, it looks like the sky’s the limit for the prices on some of these cards when someone discovers that they are undercosted and acts quickly to drain the market. If you are one of these individuals, my hat is off to you. Congratulations. You have done your homework, discovered an undervalued asset, and have capitalized on that asset. I’m not sure if there is any advice I can give you except to avoid the trap of getting in on a card too late, which you’ve probably avoided in 95% of the cases (there is always the potential for the double spike, though it doesn’t happen often – Jace, the Mind Sculptor did it in Standard). Just remember to strike while the iron is hot: those Disrupting Shoals aren’t going to sell themselves. 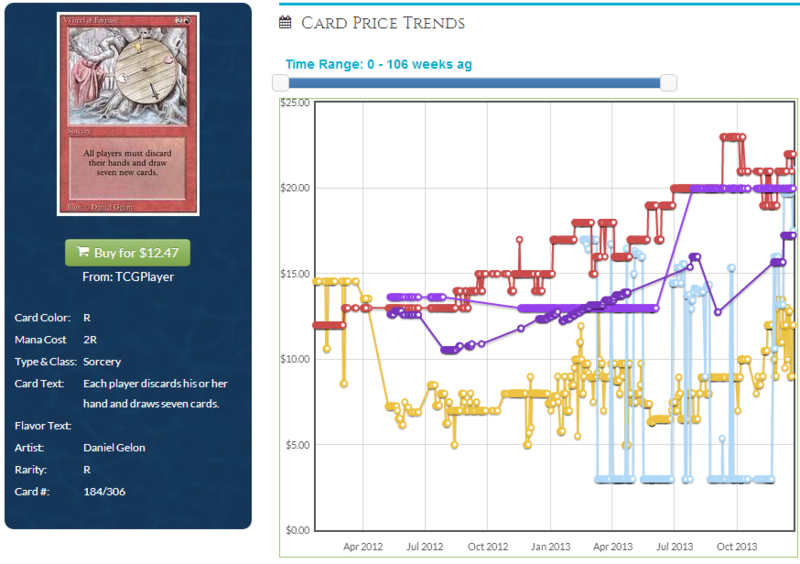 But It’s not even Modern cards that are experiencing these price hikes. 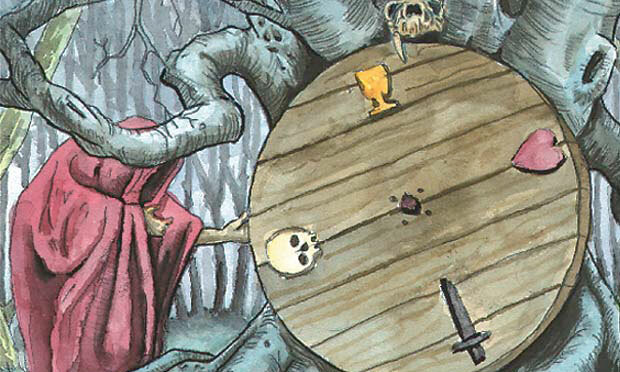 What about cards like Wheel and Deal and Forced Fruition? Nekusar hasn’t been out for long and isn’t even the flagship commander of the Mind Seize deck, so why did these random cards that only fit into a narrow strategy in a specific causal format go up in value? I might have an idea. Those holding the bag of cards that spike and then quickly plummet are similar to the penny stock investor, who decided “investing” in penny stock assets would result in a great return. However, the asset in this case is not a random number on a roulette wheel or any single name in a list of penny stocks – the asset is actually something that all of us are emotionally invested in. The first reason that these spikes happen is because players and speculators are both emotionally invested in the game of Magic. Everyone that plays Magic is emotionally invested in the game to some degree. Otherwise, why play the game? There are literally thousands of other games that could be played instead, so what makes it so special? The answer is that playing the game is fun, the wonderful community is welcoming and friendly, the feeling of opening packs and sorting a collection can’t be beat, the feeling of chasing a collection and acquiring all of the particular cards you desire is amazing, the great feeling of putting a deck together and calling it your own is the best, and the support by the company that produces the game is fantastic. Without all of these factors, Magic would falter and slowly go away. It is stronger than ever now because all Magic players are able to get emotionally invested through all of these other aspects besides playing the game. There are hundreds of websites dedicated to Magic out there, whether they sell art related to the game (card alters), offer game accessories (dice, tokens, deckboxes, playmats, etc. ), or are just reflecting on the community (Cardboard Crack). All of these factors help to cement good feelings in players’ minds about how sweet Magic is. Right, so what does emotional investment have to do with price spikes? Well, when you get pretty emotional about something, it’s much harder for logic to factor into the equation. Do you want to buy those Disrupting Shoals at $10 because you think they’re cool and there is no way they could go down due to their awesomeness? If this is your train of thought, speculating might not be for you. Speculating requires a certain amount of cold logic and forethought that a lot players don’t want to apply to their favorite past time, which is supposed to be about fun. Besides emotional investing, I believe another reason that these price spikes are happening is due to the rarity of the older cards compared to the newer ones (Wheel of Fortune anyone?). Back when Magic first came out, they had no idea how popular the game would be. They created the reserve list out of a fear of killing the game via reprints, and it seemed to work for a time. Because these cards can’t be reprinted, when a new card is released that synergizes or combos well with an old Reserve List card, that card can wind up spiking in value very fast. Even a rules change or unbanning could do this – Gaea’s Cradle and Time Spiral are examples of these cases respectively. With the Modern format Wizards can better control prices of newer cards, but older cards that are in Legacy and EDH are anyone’s guess. In addition to Reserved List cards that are never getting reprinted, cards that could also receive a reprint but have not gotten one yet are also targets for spikes. Specifically, cards in sets that are post-reserved but pre-Modern, like Masque’s (Rishadan Port), Invasion, Odyssey, and Onslaught – these blocks were printed in a time where the Magic community was only a fraction of what it is today. If a card from one of these sets is discovered to be very synergistic with a new card it, it will spike out of nowhere because the amount of copies that exist are marginal compared to the demand it will see from interacting well with a newer card. It is very hard to keep on top of all the potential combinations that exist without a good grasp on the community resources available to discover these interactions. So I will state that card rarity is always a factor in a spike, because even uncommons (Remand) can become grossly expensive without a reprint. Just because because a card is rare or hard to find does not mean that its spike is warranted. Aluren would be a good example of this – it’s a card that has a legacy deck to its name and is a casual favorite that a lot of players remember having tons of fun with. It never sustained its price, though, because the deck failed to put up enough results compared to other currently existing legacy decks. Due to the lack of demand, it then dropped down close to the original price from which it spiked. In order to avoid buying high into potential scenarios like Aluren, you want to make sure you pick up the card before it has seen a massive increase in price, you want to make sure that it can fit into a deck that has proven results backing it up, you want to make sure that even if it isn’t tournament playable that it can be popular with casual and EDH players, and you finally want to make sure that it is from a set that had a relatively small print run compared to current sets (like the post-reserve list sets I mentioned above). So in summary, the combination of emotional investing and card rarity are a recipe for a card spike. Whether the spike is real or whether it will ultimately become a bust can be hard to spot without extensive knowledge of the current tournament scene and correctly identifying the casual appeal of a card. With time comes experience, and I’m sure we’ve all made mistakes in the past in regard to cards and spikes – I certainly have. All we can do is to keep working at it and make sure that the characteristics of a card match up well with the reasons a card could spike. It can sure feel like the wild west at times with all of these card spikes, but realize that many of them can’t sustain those prices for very long and are mainly driven emotional investing and card rarity.